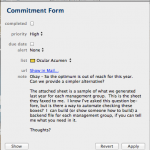 I have used numerous project management systems throughout the years. All of them had strengths and weaknesses, and most of them suffered from software bloat. Too often the management becomes the project. The process gets cumbersome and requires as many hours as the tasks themselves. That is not efficient or economically feasable for a small business. 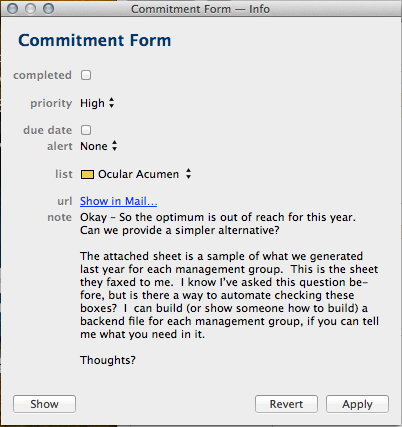 I like things simple, accessible and streamlined…and approach project management the same way. Apple is the unchallenged final authority of user interface and end user experience, but for some reason they either largely ignored their constituent’s needs or offered half-hearted attempts to assuage them (Remember when Tasks were introduced?). But that’s no longer the case, they have offered Reminders. 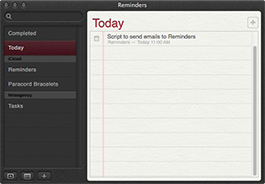 At first glance, Reminders is too simple of a task manager for a creative professional to utilize effectively. However, it offers a few benefits that makes it a viable contender for my workflow. Reminder “Lists” have been written about and are a great start to organizing projects, but the one thing that I consider to be the creme-dela-creme is the email integration. Virtually every request, project or task I receive stems from an email. And being an Apple Mail user affords me the opportunity to take advantage of Spotlight to find virtually anything easily. Long past are my days of separating email into subfolders to keep track of them, so it makes sense that I have a solution that integrates this. Reminders does not currently allow an email to be “dragged-n-dropped” to create a new reminder (Apple, we ALL would love to have this become a reality). 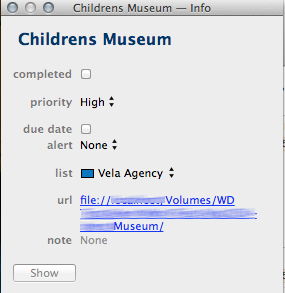 But once a reminder is created, a URL can be added to it. 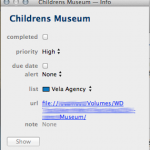 The URL could be a website, and email or a file path (drag-n-drop does work for files and emails). 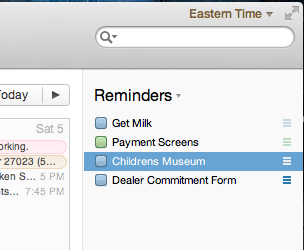 This allows me to be able to recall the email info or file anytime I access the reminder from my MacBook Pro. 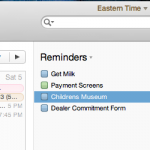 I can also add notes that can be synced via iCloud on all my Apple devices (MBP, iPad & iPhone). 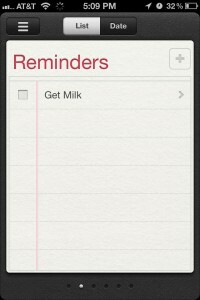 The introduction of Reminders (and iCloud) has allowed me to discontinue several 3rd party services that I used daily.